In the previous two posts, we began discussing kanji that originated from a sharp-edged object -刀 and 刂, a bushu rittoo, “knife; sword.” In this post we are going to look at kanji that came from a warrior’s axe – 王 and 士. Before our exploration I would like to start this post by sharing with our readers some of the photos of oracle bone style writing that I took a year ago at the Tokyo National Museum in the Ueno area in Tokyo (東京国立博物館 東洋館) because they support our exploration of the relevance of historical writings to modern kanji. On this display, there were fourteen pieces of animal bone or tortoise bottom shell with oracle bone writing. They were displayed in a glass case with an explanation in Japanese underneath (Photo 1). It had good lighting from the ceiling. In this section of the museum, taking a photograph is allowed as long as you do not use a flash. When I tried to take a photo, however, ceiling lights reflected on the glass, and it was not an easy job, on top of the fact that each piece was tiny. Let us look at a couple of them here. Photo 2 on the left had four writings –丁亥卜王 in kanji. 丁 is said to have come from the top of a nail, thus a small square or circular shape. The small square is also interpreted as an area rather than a nail (Ochiai 2014). 亥 was a skeleton of an animal. Here the two writing 丁 and 亥 were used to indicate the name of the day on which they sought divination. The third writing, 卜, was “cracks in the bone appearing as divination,” and the fourth writing, 王, was a king’s large ceremonial axe with its blade at the bottom and the handle at the top. This piece of four writings was a fragment of a sentence and all we can tell is that it meant “on the day of 丁亥 we sought divination about the king…” This piece was from the early 12th century B. C. and was carved on an animal bone. The person who inscribed the writing must have used a sharp narrow chisel. As I look at this piece, I feel as if his precise and decisive strokes on the bone have come alive after more than three thousands years. In every stroke we can see vividly how the sharp chisel entered, carved and was lifted. The third photo that I share on the right contains many writings on the belly side of a tortoise shell. It dated back to the 11th century, B. C. Even though it is chipped at the edges it gives us a picture of what oracle bone writing was about. Generally speaking, divination writing starts with the name of the year, such as 辛酉, 己未 and 癸丑 on this piece of tortoise shell. The third writing 卜 meant “divination,” and the fourth one 貞 also meant “divination” (originated from 卜, and 貝 a “cooking pot for a religious rite”). What was asked in divination was described in the next several writings — On the three separate days they sought to divine whether there would be a calamity to the king (王) on those nights (今夕). 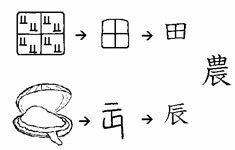 Oracle bone writing being the record of divination for a ruler, the writing for “king,” 王, appeared on many pieces of oracle bone writing. We have looked at another one in a previous post. Please refer to the earlier post for another example –The Kanji 徳待役後従- ぎょうにんべん (1) on October 25, 2015. Now that we have seen actual archaeological artifacts, let us resume our regular exploration, starting with the kanji 王. The oracle bone style writing for 王, (a) in brown, was similar to the shape in Photo 1. In bronze ware style writing the bottom line of (b) was thicker and had a curved edge, which was the blade of a king’s ceremonial axe. The second horizontal line was closer to the top line. The same proportion remains in (d) in ten style, in red. In kanji the proportion of the three horizontal lines became even. There is no kun-yomi. The on-yomi 王 /o’o/ means “king.” It is in 国王 (“king” /kokuo’o/), 王国 (“kingdom” /ookoku/), 王者 (“king; champion” /o’oja/) and ローマ法王 (“the Pope” /roomahooo’o/). For the kanji 旺, the bronze ware style writing had a footprint (止) at the top and a standing person with an emphasis on his legs at the bottom, together signifying “to go.” In ten style the crossroad was added, which made up 往 “to go,” as shown on the right, taken from a previous post. The sun (日) for “bright light” was added on the left side. Together light spreading intensely meant “vigorous; thriving.” In kanji, the right side became 王 only. There is no kun-yomi. The on-yomi /o’o/ is in 旺盛な (“thriving” /oosee-na/), as in 食欲旺盛な (“having good appetite” /shoku’yoku oosee-na/). There is no kun-yomi in Joyo kanji. The on-yomi /ko’o/ is in 皇室 (“royal family; imperial family” /kooshitsu/), 皇后 (“empress” /koogo’o/), 皇太子 (“crown prince” /koota’ishi/), 皇族 (“members of royal family”/koozoku/). Another on-yomi /no’o/ is in 天皇 (“(Japanese) emperor” /ten-no’o/). There is no kun-yomi in Joyo kanji. The on-yomi /shi/ is in 武士 (“warrior; samurai” /bu’shi/), 兵士 (“soldier” /he’eshi/), 士気 (“moral; fighting spirit” /shi’ki/) and 力士 (“sumo wrestler” /ri’kishi/). The kun-yomi 仕える /tsukae’ru/ means “to serve; be in personal service; work under.” It is in 仕事 (”work; job” /shigoto/), 仕分ける (“to classify; sort out” /shiwake’ru/), 奉仕活動 (“volunteer service” /hooshika’tsudoo/), 仕方 (“way of doing” /shika’ta/) and 仕方がない (“cannot be helped” /shikata-ga-na’i/). This entry was posted in Historical Artifacts of Kanji, Kanji Radicals, 漢字の成り立ち and tagged 甲骨文字, oracle bone writing, the kanji王, the kanji皇, the kanji士, the kanji旺, the kanji仕, 東京国立博物館. In the last post we have seen that an image of a crossroad became a bushu yukigamae (行) in 行街術衛. A crossroad was where an action took place. On the other hand, when half a crossroad (彳) was used, the move or motion seemed more apparent. We would imagine that half a crossroad (彳) must have derived from the full shape of a crossroad (行). But, from what I see in oracle bone style samples, both shapes already existed by then, as we will see in 1. The name gyooninben comes from the on-yomi /gyo’o/ of the kanji 行, even though the kanji 行 belongs to the bushu yukigamae group in the traditional kanji dictionary. The first kanji that we came across that contained the bushu gyooninben was the kanji 徳 in connection with an eye (Eye Wide Open (2) 直値植置徳 posted on March 25, 2014.) We saw that the shape 直 originally came from an eye looking straight ahead that was signified by a vertical line. The horizontal line at the top (十) was originally a bulge in the vertical line to emphasize that the line was straight. The angle at the left bottom below 目 was an emphasis of being straight. For this post I have added a couple of samples for the kanji 徳. The two oracle bone style sample (a) and (b), in brown, are mirror images − We have seen many times that in oracle bone style whether a component faces right or left did not carry a particular meaning. Each had an eye looking straight ahead, and a crossroad. The writing meant that one behaved oneself in a straight manner. In the second bronze ware style sample, (d), in green, a heart was added. One had to act straight using not only his eyes but also his heart. In ten style (e), in red, a crossroad became more prominent. In kyujitai (f), in blue, the extra line above 心 was the remnant of an angle that 直 had. So the kanji 徳 is a heavy loaded kanji that meant “a way of life in which one should follow his own heart in a straightforward way.” If you live that way you would be someone of “virtue; merit; good (acts).” I am overwhelmed by morality of this kanji every time I see it. 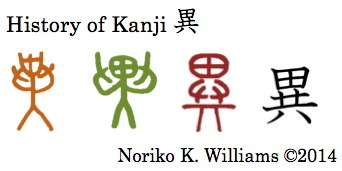 The kanji 従 was discussed in connection with two people standing side by side (The Kanji 人仁従縦比皆階陛 – Posture (3) on April 5, 2015.) The first oracle bone style sample (a) was just two people standing viewed from the side, signifying “a person following another.” In the second oracle bone style sample (b), a crossroad was added on the left side, giving the sense of forward motion. In bronze ware style (c) a footprint was further added below the two people adding the sense of walking. In ten style (d) this footprint was moved to the left, just below a crossroad. When a crossroad and a footprint were aligned vertically, they usually became the precursor to the bushu shinnyoo. However something interesting took place in this kanji. In kyujitai (e) this footprint moved back to the original position, below two people, leaving the crossroad back in its original shape. The two people were kept as two small 人, which became the two stroke ソ shape in shinjitai. Unless we are shown the original shapes we would never have guessed that the current shape 従 originated from just two standing persons. Yesterday in Tokyo I had a chance to see a few actual pieces of oracle bone writing that dated from the 13th century B. C. The visit to this small museum (Taito-ward Calligraphy Museum 台東区立書道博物館 in Tokyo near the Uguisudani station on the Yamanote Line) was on my agenda for my visit to Japan this time, but for various reasons it was only yesterday that I was able to visit it. This museum originated from a private collection by an artist-calligrapher before the WWII and was donated by his family to the Taito-ku (ward) in Tokyo more recently. Unlike many art museums in Japan, which started as private collections of wealthy art loving industrialists who had amassed a fortune in modern times, this collection is a modest one and the layout of of the exhibit is rather outdated and not as easy for a visitor to see the objects because of poor lighting. Nonetheless the opportunity to see first-hand the actual archeological pieces was exciting to me. It was also very timely for discussing the kanji 従 in today’s post. On the right, (A) is a piece of an animal bone with oracle bone writing carved, taken from the article in Yomiuri Shinbun (October 20, 2015). (B) is what I reproduced from the photo. The left side may be incomplete because it is not legible. 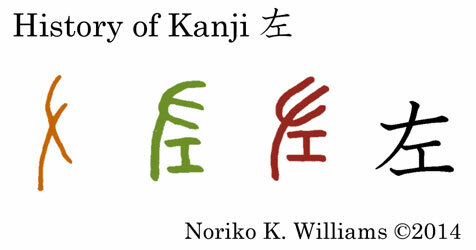 (C) is the kanji based on my reading with the help of the accompanying article in the paper. (This exhibit did not give out any literature that I was able to bring home.) It reads vertically from the right top to the left bottom. It says “The king (王) asked for a forecast (貞) on whether he would make a certain tribe chief (sanzui and 止) follow (従) him or not.” A new sentence starts from the third writing 王, 従, then moves to the left writing. Even in this tiny piece of cow’s bone (the piece is only one inch-wide), we see two samples of the kanji 従 – They were two people standing, one following another. This entry was posted in Chinese character radicals, Historical Artifacts of Kanji, kanji, kanji etymology, Kanji Radicals and tagged ぎょうにんべん, 甲骨文, oracle bone writing, the kanji 徳, the kanji役, the kanji待, the kanji後, the kanji従. In this post, I am going to discuss the kanji that have “two hands from below”: 共, 供, 異, 興, 具 and 兵. We immediately spot that they all have a shape that is like the kanji 八 squashed flat a little. They are hands trying to lift something. In bronze ware style, the components were same as that of 共, and in ten style, by adding a ninben, it indicated the act that a person does with both hands, which was “to make an offering to” or “to keep someone company; accompany someone.” There are two kun-yomi for 供. They are in お供え (“an offering (that one leaves on an altar table)” /osonae/) and お供する (“to accompany a person” [humble style] /oto’mo-suru/). There are also two on-yomi for 供. /Kyo’o/ is in 提供する (“to sponsor; supply; furnish” /teekyoo-suru/) and /ku/ is in 供物 (“offering at alter” /ku’motsu/). If you guessed that this must be a go-on because it appeared to have a bearing on Buddhist practice, you are right. Naturally the reading /mo’tsu/ for 物 is a go-on too, as seen in 荷物 (“luggage” /ni’motsu/). You probably have seen the word /kodomo/ written in both 子供 and 子ども and wondered why in hiragana. Because the kanji 供 means “accompanying,” some people consider it to be pejorative. Even in this age of children’s rights, I am quite puzzled by this logic. 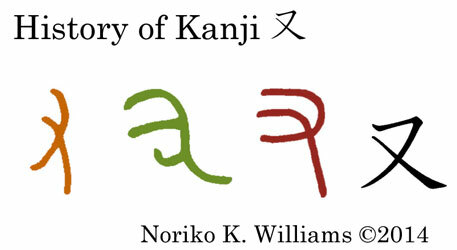 Now that we have a chance to see the origin of the kanji 供, I still do not see what the fuss is about. I once showed to the students of my second-year Japanese class the photo of bronze ware style inscriptions in the famous huge bronze ware pot called Daiutei (大盂鼎 Dà Yú Dĭng), and asked them to decipher the writing. The writings were in bronze ware style. One by one they guessed and enjoyed this new game. And someone said, “There is a guy doing rap!” [The photo on the right (Ishikawa 1996)] Indeed he looked like that. Looking at a photo of ancient artifacts in that way makes the kanji alive. The kanji historians’ interpretation is that he was putting on a fearsome mask over his face to turn himself to another character. From that it meant “peculiar; different.” The kun-reading is in the adjective 異なった (“different” /kotona’tta/) and in the verb (~と) 異にする (“to differ from~” /to koto’-ni-suru/.) The on-reading is in 異説 (“conflicting view” /isetsu/) and 異常な (“unusual; extraordinary /ijoo-na/). 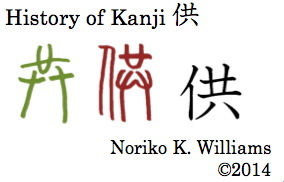 Notes: After some exchanges of the comments with a reader on the interpretation of the ancient writings of the kanji 異, I have written its follow-up article entitled “Kanji 異 Revisited and 典其選殿臀” posted on September 26, 2014. Thank you. In oracle bone style, a pair of hands at the top and another pair of hands from below were holding something in the middle. In bronze ware style and ten style, the top and the bottom separated. Shirakawa (2004) says that what was in the middle was a vase which contained sake that a priest sprinkled around to wake up the spirit of the earth. From people trying to raise something together at once it means “to raise; start; to resuscitate.” The kun-reading is in 興す (“to start something new; revive; resuscitate”/oko’su/). The on-reading /kyo’o/ is in 興味 (“interest” /kyo’omi/), 即興で (”extemporaneously” /sokkyoo de/). Another on-reading /ko’o/ is in 新興の (”newly-risen” /shinkoo-no/). Lately, you see the word 町おこし (“revitalization of a locality” /machi-o’koshi/) quite a lot in the news. Even though the media tend to use the hiragana, it is in this meaning, that people do something to revive the locality by creating an event or project. Because it is a Japanese word, it is not that necessary to use this kanji, however. In oracle bone style and bronze ware style what two hands were holding above was a tripod (鼎 /kanae/) or cowry (貝 /ka’i/). A tripod was used to cook sacrificial animals for a religious ceremony, and cowry was used as currency in ancient times. So both are things that had important substance. From placing something important with both hands, it meant “filling; to be equipped.” The kun-reading is in 具わる (“to be equipped with” /sonawa’ru/) and the on-reading is in 具 (“topping/filling on food” /gu/), 具体的に (“concretely” /gutaiteki-ni/), because you would give the details, and 金具 (“hardware/metal fittings” /kanagu/). Just as I was about to write that “the top of the oracle bone style (the first one) was an axe,” I thought “I do not think I can convince my readers.” So, I went back to my source (Akai 2010) and found the second one, which showed the blade of an axe better. An axe was a weapon, and someone who held a weapon is a soldier. So it meant “soldier.” In writing the kanji 兵, the third stroke starts a little below the beginning of the second stroke, much like the kanji in the upper right of the kanji 近 (“near”), in which 斤 was used phonetically. The old Japanese word for solider was /tsuwamono/, and this kanji is sometimes read as /tsuwamono/. The on-reading is in 兵士 (“soldier” /he’eshi/), 兵器 (“weapons” /he’eki/) and 派兵 (“sending military” /hahee/). This entry was posted in Chinese character radicals, Historical Artifacts of Kanji, Japanese Writing, Kanji History, Kanji Radicals and tagged Hands from below, Kanji, the kanji 異, the kanji 興, the kanji 共, the kanji 兵, the kanji 具, the kanji 供. The kanji and bushu shape 又 originated from a right hand that showed three fingers and a wrist. Back in February, I talked about the oldest artifact in kanji related to Japan, the gold seal of the Japanese King of Na 漢委奴國王 given by a Chinese Han emperor, in 57 A. D. [Link to the article.] 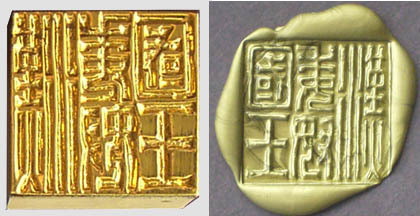 On this one inch square solid gold seal, in 又 on the right side of the third kanji 奴, we could see four fingers, instead of three fingers. Going through reference books, I still have not come across another example like that. Very intriguing. In discussing the shapes that came from a hand, I would like to start with 又 in this post. 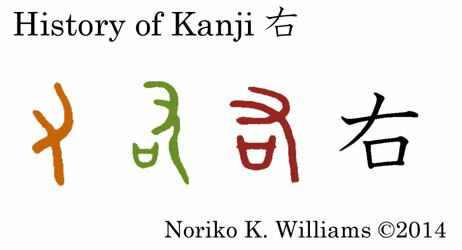 This shows the development of the kanji 又: Oracle bone style is in brown; bronze ware style in green; ten-style (official seal style) in red; and the last one in textbook style kanji. The bronze ware style here even suggested a thumb at the bottom (it was shorter and bending a little at the tip.) The shapes were all a right hand and meant “right side.” When one helped someone, he lent a right hand. So, this writing came to be used to mean “to help; helping hand,” and it appears in numerous kanji as a component. In the kanji, by itself, however, it lost the meaning of “right hand” and “help.” The kanji 又 /mata/ means “also; in addition to; again,” and also used in words such as 又貸し (“sublease” /matagashi/) and 又は (/mata’wa/) “or; alternatively.” There is no on-reading. Since 又 “right hand” was taken over by the meaning “to help,” a new writing was created by adding 口 “a mouth/word (to put in a word for),” as shown in bronze ware style and ten style. From a right hand that helped, it meant “right side.’ But in the kanji, the meaning “to help” disappeared, and instead, a left hand expresses that, as we will examine in (5). Shape-wise, in the kanji the middle long stroke became a horizontal line. It is used in words such as 右の方 (“the right side /migi no ho’o/) and 右手 (“a right hand” /migite/) in kin-reading, and 右折禁止 (“no right turn” /usetsukinshi/) and 右派 (“conservative faction of a political party” /u’ha/) in on-reading. Here we have two right hands. The third and fourth bronze ware style had a 口 “mouth/words” underneath. They meant two (or many) people pledge to help each other. The writing meant “amicable relationship” and “friend.” It is used in words such as 友達 (“friend” /tomodachi/) in kun-reading,and 親友 (“close friend; best friend” /shinyuu/) and 友好国 (“ally (country)” /yuuko’okoku/) in on-reading. Another kanji that shared the same oracle bone style as the kanji 又 was the kanji 有. In this case, it meant “to have.” In bronze ware style, the left sample had two short lines and the other sample had a piece of meat (月) under a right hand. The shape 月 had a few different meanings: “moon”; “a piece of meat” (think of the kanji 肉 “meat”); and a “boat.” A right hand holding a piece of meat meant “to have” or an indication of “existence.” It is used in words such as 有る (“to exist; to have” /a’ru/) in kun-reading and 有名な (“famous” /yuumee/) and 所有物 (“possession” /shoyu’ubutsu/) in on-reading. The oracle bone style was a mirror image of 又. So, it must have been a left hand. It makes sense, doesn’t it? In bronze ware style and ten style, the shape 工 was added. The kanji 工 came from a carpenter’s tool, a work table, or a craft and it means “craft.” One holds the crafted work with his left hand to work on. So, the kanji 左 meant “left.” The kanji 左 is in 左側 (“left side” /hidarigawa/) in kin-reading, and 左右 (“both sides” /sa’yuu/) in on-reading. Because the left hand helps what the right hand does, it also meant “to help” when used as a component in some kanji, such as 佐 “to assist,” as in 補佐 (“aid; assistant” /ho’sa/). This entry was posted in Chinese character radicals, Historical Artifacts of Kanji, Japanese Writing and tagged JLPT 1, JLPT 2, kanji blog, 漢委奴国王金印. This is part 2 of the kanji radical 辰 discussion. Since then other reference materials (Akai 1985 and 2010) have come to my attention. The ancient writing on the left may give us a fuller picture of how the kanji 農 came about. In oracle bone style, (a), the top had trees, suggesting a wooded area and the bottom had a shell, which is the same shape as the oracle bone style for 辰 that we have seen in part 1. In bronze ware style, (b) and (c), the top was rice paddies, the bottom was a shell, and (b) had two hands next to the shell. In ten-style, (d), two hands were placed around the rice paddies at the top. By adding the bushu 寸, “hand,” to the clam shell, 辰, we get another kanji, 辱. It originally meant working in the field, with a hand using a tool. The on-reading is /jo’ku/. The two components 辰 and 寸 created a new meaning without using the sound of /shi’n/. So, this too must be a semantic composite. That would be our thinking. However, as it turns out, this kanji has a totally different meaning. It means “to humiliate; insult” in words such as 侮辱する (“to insult” /bujoku-suru/) and 屈辱的な (“humiliating” /kutsujokuteki-na/.) The kun-reading is 辱める (“to humiliate” /hazukashime’ru/.) Very potent words! How did it come to mean that? The answer is, “We do not know.” Sorry. Even ancient kanji scholars scratched their heads. For that sort of kanji, the compiler of the most important first kanji dictionary called 『説文解字』 (/setsumon-ka’iji/, Shuowen Jiezi in Chinese) made a category called 仮借文字 (“borrowed writing” /kashaku-mo’ji/.) The literal meaning of kashaku is “temporary borrowing.” Only a few of thousands of kanji belong to this category. Among the familiar kanji, 彼, 我 and 東 come to my mind. This entry was posted in Chinese character radicals, Historical Artifacts of Kanji, Japanese Writing, Kanji History, Kanji Radicals and tagged clam, JLPT 1, JLPT 2, Kanji, kanji blog, Shuowen Jiezi. The red image on the left is an impression of a rubber stamp of the replica. It is easier for us to see the writing. I would like to draw your attention to ancient writing in the center of the bottom row. Its kanji form is 奴. The left side (女) is a woman sitting with her hands crossed in front. 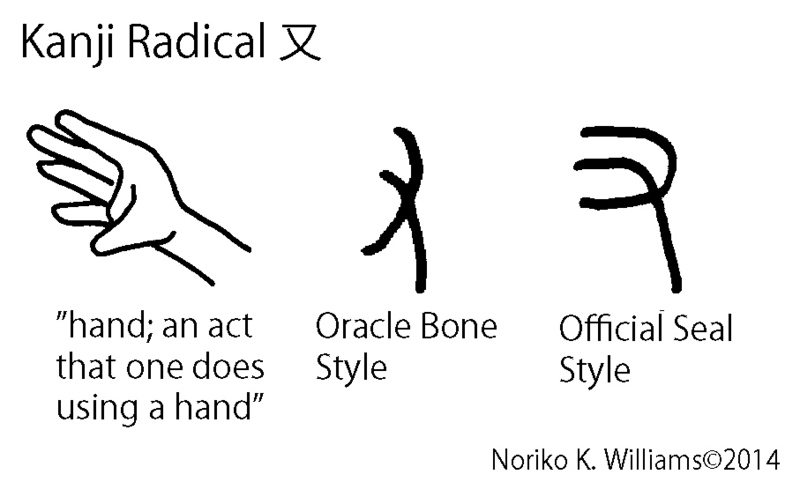 The right side (又) is another radical shape called yoo or mata, and it pertains to a hand or an act that one does using a hand. The two ancient forms for 又 are shown on the right. Look closely at the area marked in a blue box on the imprint of the seal in red. By contrast to the two ancient writings on the right, which showed three fingers, do you see an extra line in the seal? It is another finger! The seal maker must have reverted to the original meaning of a hand with fingers. It was a delightful discovery when I obtained the replicas from the Fukuoka City Museum. 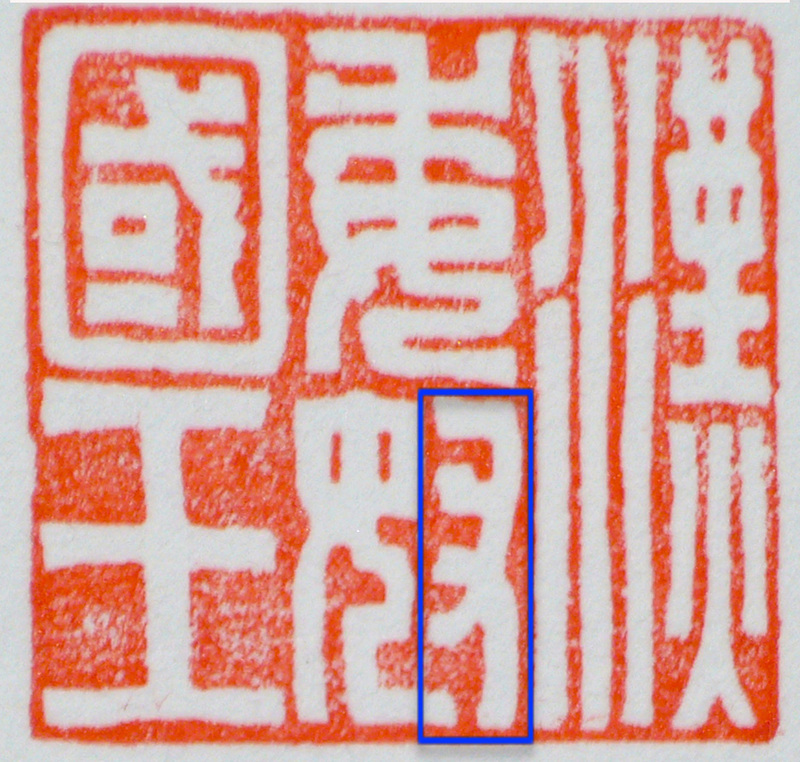 This entry was posted in Chinese character radicals, Historical Artifacts of Kanji, kanji etymology, Kanji History, 漢字の成り立ち and tagged Japanese King's Gold Seal, Kanji, the kanji 奴, 漢委奴国王金印.